Book Review | Are You My Guru? Are You My Guru? 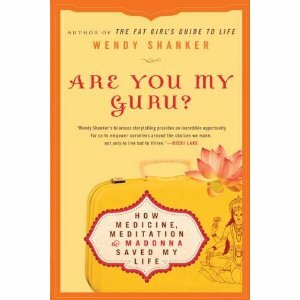 was written by Wendy Shanker who also authored The Fat Girls’s Guide to Life. The ironic thing about that is that after writing the first book she discovered she had a rare autoimmune disease that caused her to lose weight. She finally became happy and comfortable in her body only to find that she no longer fit in her body. Are you my guru chronicles Wendy’s search to cure Wegener’s granulomatosis through western medication, then through eastern medicine and finally found a combination of both that is working for her. Wendy found inspiration through Madonna, Kabbalah, Cranial Sacral work, Astrology and more. Wendy’s story is ultimately a tale of learning to trust yourself and to learn that you are the expert on your body. Doctors are amazing and they might be an expert in their field but they are not experts on you. Only you can do that. It’s something that I have learned the hard way over the last three years with my son. He is affectionately known as the backwards boy to the Stroke Rehab department of our children’s hospital. I refuse to allow doctors to discuss potential side effects of medication, surgery’s or procedures in front of him because he makes a subconscious check list and then has to mark them off. I have searched out alternative therapies, medications and procedures for him all in the face of doctors telling us not to waste our time and money but you know what? Those are the things that help him the most. I’ve learned that for now I am the expert on my son. Reading Are You My Guru?, helped to remind me that is true for all of us. It can give you the courage you need to stand up for yourself when a doctor tells you nothing is wrong but you can feel it is. The book is hysterical in places, sad in others. Wendy is amazing in that she kept searching until she found her answers. If you have medical concerns or know someone facing them it’s a book worth reading. It gives the patients perspective concerning well meaning relatives and friends. It can also give you hope when the road before you seems long and uncertain. I thoroughly enjoyed this one.